The Ruffwear Overcoat is a classic cold-weather utility jacket. 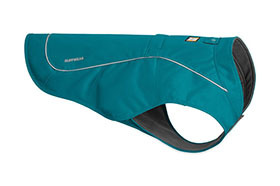 This vest style jacket is built with sturdy, durable materials to keep up the most active dog cozy. Wind and water resistant outer fabric protects against bad weather, while interior recycled fleece lining keeps body heat in. The perfect combination of materials for a great coat. Side-release buckles on both sides provide easy on/off, and a leash portal allows the Overcoat to be worn over harnesses.